How do I schedule automatic restarts or other tasks? Tired of manually restarting your server every day? Looking to announce a message at a specific time? This guide can help! 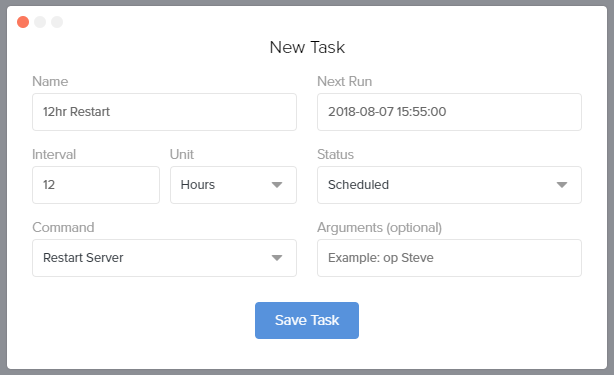 Automated tasks are an invaluable resource for server management! You can set up server-wide messages, server restarts, and even custom commands right within Prisma. To do so, just follow along in this article and we'll get you squared away! Name: This can be whatever you'd like. For simplicity sake in our example, we'll say that we're creating a task to restart the server every 12 hours so we'll name it "12hr Restart"
Next Run: By default, this will be in the next minute. You can set this to whatever you'd like; In our example, Prisma will run it every 12 hours from the time that it runs next. Interval & Unit: Set this to how frequently you'd like the task to run in a whole number (no decimals). In this case, we're going to set it to 12 hours. Status: If you'd like to pause the task for any reason, you can do so here. This is the on/off switch for scheduled tasks. Command: For restarts, you'd run the "Restart Server" command. Arguments: For restarts, you can leave this field blank. Can I add a broadcast (/say) warning before the server is restarted in case players are online? To add this message, you'd just type "WARNING!" The server will restart in 5 minutes!" into the "Arguments" field, then save. You'll also want to be sure that you adjust the "Next Run" field in accordance to a time that makes sense if you're setting it up alongside restarts. Just take a look at your restart command and the time it's scheduled for, then adjust your broadcast task to run next 5 minutes before the restart task and you'll be good to go!